The pair loses further ground to the mid-65.00s. Brent gains are sustaining the upbeat tone in RUB. API, EIA reports next of relevance. The better sentiment around the Russian Ruble is now propping up the down move in USD/RUB to fresh daily lows in the 65.50 region. Spot is partially reverting Monday’s advance backed on the positive momentum in crude oil prices and renewed hopes of extra progress in the US-China trade dispute, as talks are underway in Beijing. Back to crude oil, the European reference Brent crude is posting moderate gains beyond the $62.00 mark per barrel today, always bolstered by speculations of a positive outcome from the US-China talks. 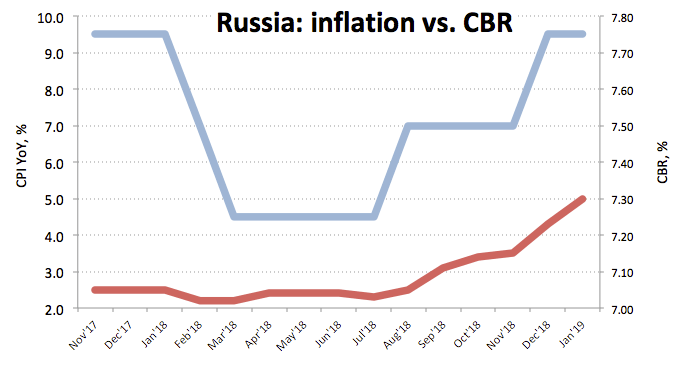 The CBR left its monetary conditions unchanged at last week’s meeting, adding that inflationary risks keep pointing to the upside in response to the recent increase in the VAT and the depreciation of RUB in H2 2018. The central bank sees inflation picking up pace in the next months, although consumer prices should drift to the bank’s 4% target at some point in H1 2020. That said, the tightening cycle remains well in place despite the current ‘pause-mode’. Furthermore, the carry-trade should be supportive of the domestic currency along with projected higher oil prices. On the negative side, the spectre of further sanctions on Russian citizens or the economy as well as geopolitical jitters carries the potential to undermine the momentum in RUB. At the moment the pair is retreating 0.31% at 65.56 and a breakdown of 65.16 (2019 low Jan.31) would expose 64.95 (monthly low Oct.24 2018) and finally 64.90 (monthly low Nov.22 2018). On the other hand, the next support lines up at 65.81 (21-day SMA) seconded by 66.10 (200-day SMA) and then 66.69 (high Jan.25).